Towards the end of 2011, Susan was approached by a freelance journalist writing an article on ACEOs who during the course of her research was conducting interviews with artists producing artwork in this miniature format. The finished piece appeared in the January 2012 issue of the UK's Artists & Illustrators magazine. Susan is one of four artists quoted in the article. Three well established popular ACEO painters, Irina Garmashova-Cawton, Suzanne le Good and Anne Marsh feature, having all been painting in this format and selling both originals and prints online for a number of years. As a relative newcomer to the ACEO scene, Susan provides a complete contrast. 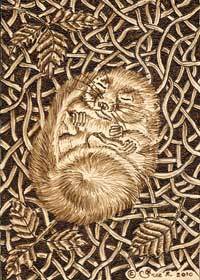 In addition to working in an entirely different medium, it is only recently that she has made a very small number of her original pyrography designs available as Limited Edition prints in the ACEO format. The term ACEO stands for Art Cards, Editions and Originals. They are miniature works of art which in order to qualify must measure 2.5" x 3.5", a uniform standard size recognised by collectors. The size is the only restriction imposed and the artist is free to choose any subject, medium or material in it's creation. They can be original pieces of art or reproductions of originals in Limited or Open Edition print format. ACEOs were inspired by the popular and highly collectable Sport Cards and later Artists Trading Cards (or ATCs), a movement established in the late 1990s by the artist M Vanci Stirnemann. The purpose of ATCs was to encourage artists to exchange their miniature works of art with one another. The key difference between ATCs and ACEOs is that whereas ATCs are traditionally traded or swapped amongst artists, ACEOs are produced with the intention of selling to collectors. These miniature artworks are now widely available in a range of styles and mediums on many themes. An affordable means of collecting different artists work, ACEOs can be displayed in a variety of ways including collectors albums or traditionally mounted and framed. Last year Susan decided to make six of her more intricately detailed original designs of popular subjects available in a Limited Edition run of fifty ACEO sized prints. 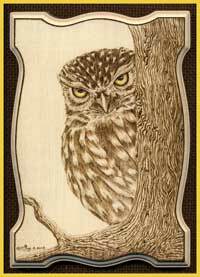 Two are illustrated on this page; "Peek-a-Boo" from an original pyrograph on sycamore of a little owl peering from behind a tree and "Docile Dreamer" from an original pyrograph on buffalo leather of a hibernating dormouse dozing in a nest of tangled honeysuckle bark and bramble. Much of Susan's original pyrography work adorns a range of wood and leather giftware that is functional and decorative as well as collectable. The three dimensional, tactile nature of the pieces are part of their charm. However, working in such detail in this medium is very labour intensive as pyrography is not a process that can be hurried. Even the smallest piece can take several hours to complete. Susan is finding that there is now an increasing demand for her designs as works of art in their own right. The miniature size of ACEOs are therefore ideally suited. Since any material can be used in their creation she plans to produce individual pyrographic ACEOs on leather. Complementing the natural surface on which they are worked these will mainly be on a wildlife theme. Look out for her original ACEOs coming soon to her Online Shop. Susan's ACEO prints can already be purchased online. Commissions are also undertaken for ACEO sized personalised third anniversary designs, examples of which can be seen in the Leather gallery.